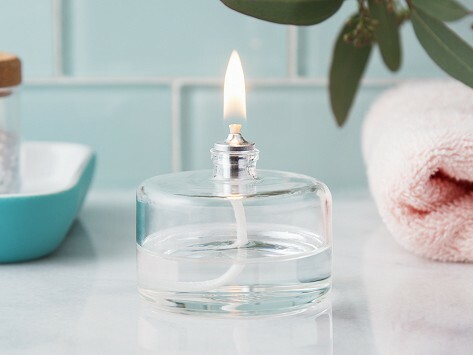 This glass oil votive is a simple, lovely-looking way to cast a warm glow and it runs on a paraffin oil alternative. It’s made with durable, hand-blown borosilicate glass and can work indoors or outside. Use with Firefly Fuel’s own lamp oil that is a longer-lasting, cleaner-burning choice that’s smoke- and soot-free and odorless, too. Pick from three votive sizes, or go for the trio set. Funnel included. Capacity: Small: 2 oz. ; Medium: 3 oz. ; Large: 5 oz. Weight: Small: 0.1 lb. ; Medium: 0.13 lb. ; Large: 0.19 lb.